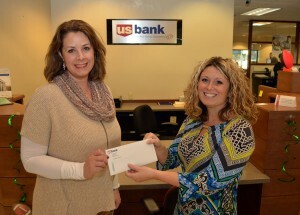 CAP’s Skills program receives U.S. Bank Foundation grant – CAP Services Inc.
Nicole Harrison, left, CAP Services’ VP of Human Development, receives a grant check from Kelly Johnson, U.S. Bank Branch Manager and Small Business Specialist, Tuesday, Nov. 29, at U.S. Bank in Stevens Point. The funds will help support CAP’s Skills Enhancement Program. U.S. Bank Foundation has made a $1,000 grant to CAP Services to support its Skills Enhancement Program. The Skills program, which is available in Portage, Waupaca, Waushara and Outagamie counties, is a locally designed workforce development program that assists working, low-income individuals obtain the skills needed to compete for living wage jobs. The program assists with tuition, books, and training-related transportation and child care costs that participants could not otherwise afford. For more information, including eligibility criteria and contact information of the Skills Development Manager in your area, visit capservices.org/skills. Strong communities are built upon strong foundations. To build those strong foundations, U.S. Bank invests in innovative programs designed to serve local community needs. Through the U.S. Bank Foundation Community Possible platform, they invest their time, resources and passion in economic development by supporting efforts to create stable jobs, better homes and vibrant communities. In 2015, the U.S. Bank Foundation provided $25.5 million in grant funding and matching gifts and dollars for doing contributions.